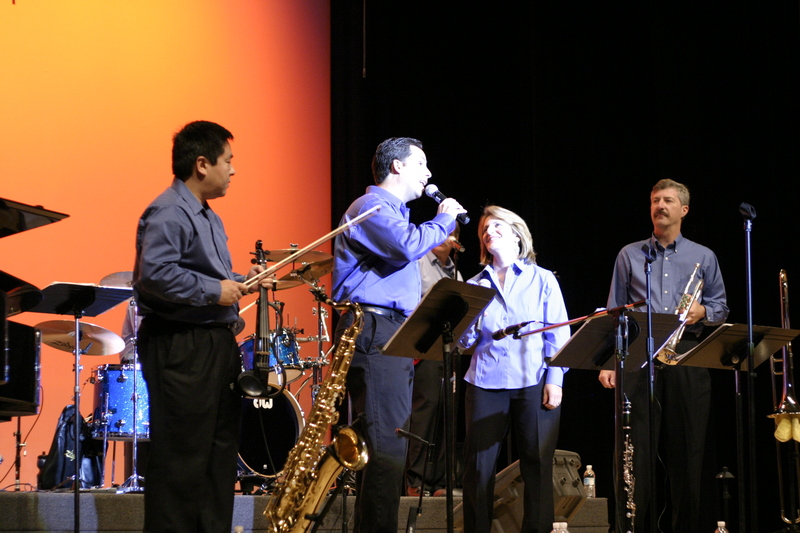 The South Coast Simcha Band is excited to bring Classic American Klezmer to our audiences! The band has been together for over 20 years, and is based in Southern California. The band leader Renah Wolzinger is a Recording Arts and Media Instructor. Renah and her trumpet playing husband Keith sought out traditional Klezmer music and discovered KlezKanada, an annual cultural festival that takes place in the Laurentian mountains outside of Montreal, Canada. Renah and Keith had heard Klezmer and Yiddish music growing up, but never learned the art first hand. At KlezKanada they learned to play Klezmer music in the oral tradition with no music, from European musicians as well as some very well known East Coast musicians including members of the Klezmatics, the Klezmer Conservatory Band and the Epstein Brothers Band. The South Coast Simcha Band developed as a project to bring traditional Klezmer music to West Coast audiences. Many of our fans are so happy to hear tunes they remember from their wedding, bar mitzvah, or even from the old country. The band has recorded several albums. Their CD “Yiddish America” is dedicated to Renah’s late mother and grandmother, to whom she dedicates her work in cultural preservation. The CD was on the Grammy nominating list for “Best Traditional World Music Album. The South Coast Simcha Band continues to arrange, compose, record and perform Klezmer music to audiences everywhere, and is honored to be a part of the preservation of Klezmer and Yiddish music. The South Coast Simcha Band consists of sixmembers. However, we can change the size and instrumentation of the group for private parties. SCSB specializes in Yiddish, Klezmer, and Israeli music, and also plays a wide variety of pop, standards, jazz, and classic rock and roll. Congratulations to the South Coast Simcha Band! This entry was posted in Uncategorized and tagged clarinet, huntington beach, israeli, Jewish, jewish music, Klezmer, klezmer music, music, orange county on September 2, 2011 by rwolzinger. Simcha Band, a set on Flickr.